Media Guest - "The Incredible Hulk"
Louis Jude Ferrigno, born November 9, 1951, is an American actor, fitness trainer, fitness consultant and retired professional bodybuilder. As a bodybuilder, Ferrigno won an IFBB Mr. America title and two consecutive IFBB Mr. Universe titles, and appeared in the bodybuilding documentary Pumping Iron. As an actor, he is best known for his title role in the CBS television series The Incredible Hulk and vocally reprising the role in subsequent animated and computer-generated incarnations. He has also appeared in European-produced fantasy-adventures such as Sinbad of the Seven Seas and Hercules, and as himself in the sitcom The King of Queens and the 2009 comedy I Love You, Man. 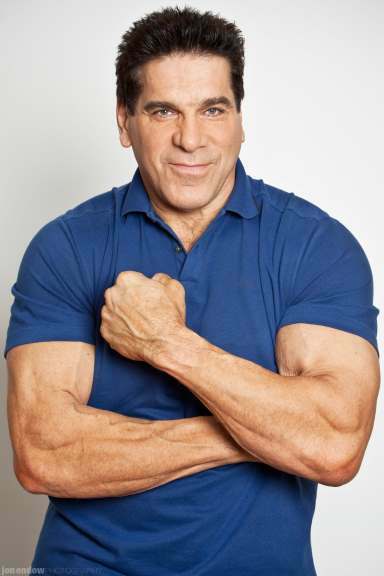 Lou was born in Brooklyn, New York, to Victoria and Matty Ferrigno. His father was an Italian-American police lieutenant. Soon after he was born, Lou suffered a series of ear infections and lost 75% of his hearing. Undeterred by what some may have perceived as a disadvantage, Lou threw himself into athletics, predominantly weightlifting and bodybuilding. Lou started weight training at age 13, citing bodybuilder and Hercules-star Steve Reeves as one of his role models. He was also a fan of the Hercules films that starred Reeves and would later himself play Hercules. Lou's other childhood heroes included Spider-Man and the Hulk. Lou won his first major titles in 1973 - IFBB Mr. America and IFBB Mr. Universe - during which, he lived in Columbus, OH. Lou was only 21 when he won his first Mr. Universe title, a Guinness Book world record that stands to this day. In 1974, he came in second on his first attempt at the Mr. Olympia competition. He came in third the following year, which was documented in 1975s documentary, Pumping Iron. 1977 brought the release of the now-iconic bodybuilding documentary, Pumping Iron, and the attention of television producer Kenneth Johnson (Six Million Dollar Man, The Bionic Woman, V, Alien Nation), who was seeking the right person to portray the larger-than-life comic book superhero, The Incredible Hulk. With his 6' 5" , 285 lb. frame, Lou was the biggest professional bodybuilder at the time. He auditioned for the part of the green-skinned Goliath, winning the part over fellow bodybuilder, Arnold Schwarzenegger. Lou was cast in the title role opposite Bill Bixby, who played his meek scientist/alter ego. Although Lou and Bixby did not share lines on camera, except for one episode "King of the Beach", the two were friends, with Lou describing Bixby as "a mentor and a father figure" who took Lou under his wing. Lou continued playing the Hulk role until 1981, although the last two episodes were not broadcast until May 1982. The Incredible Hulk was a huge ratings success and spawned several TV movies after the initial TV series completed its run. Lou's most recent credits include guest appearances on the CBS sitcom, The King of Queens, Hulk (2003), The Incredible Hulk (2008), I Love You, Man (2009), The Avengers (2012), and Celebrity Apprentice: Season 5 (2012). Be sure to support our guests by attending their panels and purchasing an autograph or picture. They have come a long way to be a part of our convention so show them how much we appreciate them. Click on the years below for a listing and information about our past guests at ValleyCon! We have had a wide array of artists, authors and media guests that stretch through many different genres and fan groups.